[POM Staff]: Thank you for calling. How may we help you? [Potential Client]: I need to schedule an appointment for a DNA paternity test. [POM Staff]: Will the results be used for your own personal knowledge or will this need to be a Legal DNA Test? [Potential Client]: What do you mean?? There are several options in types of DNA testing available, but most of them boil down to results being delivered in a “Legal” or “Non-Legal” version. Costs of these versions differ greatly, so it’s important for the client to understand what they are buying. Legal DNA paternity tests are often significantly more expensive than personal DNA paternity tests, but for good reason. There is usually important benefits at stake that are contingent on the results of the test. (Check out our earlier post listing several reasons where DNA testing can be very useful). Each patient (typically the alleged father, mother, and child) are formally identified to the individual conducting the sample collection. This typically involves producing government-issued photo IDs, witnessing signatures, and taking photos of any minor children. 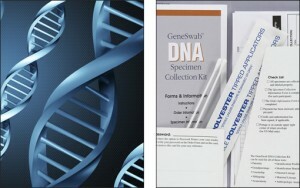 DNA specimens are collected, labeled and packaged individually in the presence of the patients. Specimens are kept in a controlled place and not left unattended. The Collector securely packages the specimens for shipment to the DNA lab. The DNA lab acknowledges receipt of specimens and all documentation become business records. So, when you are shopping for the right DNA testing service for your personal situation, be sure to understand how the test results will need to be used.